Definition at line 70 of file lltreenode.h. Definition at line 73 of file lltreenode.h. Definition at line 112 of file lltreenode.h. Definition at line 84 of file lltreenode.h. Definition at line 88 of file lltreenode.h. References i, and LLTreeNode< T >::mListeners. Referenced by LLOctreeNode< T >::~LLOctreeNode(), and LLTreeNode< T >::~LLTreeNode(). Definition at line 83 of file lltreenode.h. Referenced by LLSpatialPartition::cull(), LLSpatialPartition::doOcclusion(), LLSpatialPartition::getObjects(), LLOctreeNode< T >::getOctListener(), LLSpatialGroup::getParent(), LLSpatialPartition::processOcclusion(), LLSpatialPartition::put(), LLDrawPoolBump::renderActive(), LLSpatialBridge::setVisible(), LLOctreeRenderNonOccluded::traverse(), LLRelightPainter::traverse(), LLOctreeMarkNotCulled::traverse(), LLSpatialGroup::unbound(), LLSpatialBridge::updateSpatialExtents(), and validate_occlusion_list(). Definition at line 82 of file lltreenode.h. Referenced by LLOctreeState< T >::addChild(), LLSpatialGroup::handleChildAddition(), LLSpatialGroup::LLSpatialGroup(), and LLOctreeState< T >::removeChild(). Definition at line 76 of file lltreenode.h. Definition at line 75 of file lltreenode.h. Referenced by LLTreeState< T >::setNode(), and LLOctreeTraveler< T >::traverse(). Definition at line 118 of file lltreenode.h. 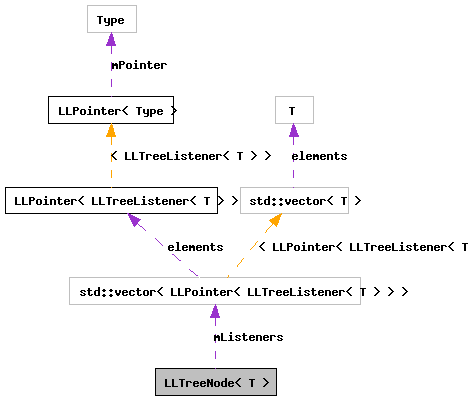 References i, LLTreeNode< T >::mListeners, and LLTreeNode< T >::mState. Referenced by LLSpatialGroup::addObject(), LLOctreeRoot< T >::insert(), LLOctreeState< T >::insert(), and LLSpatialPartition::put(). Definition at line 140 of file lltreenode.h. Referenced by LLOctreeState< T >::remove(), and LLOctreeState< T >::removeByAddress(). Definition at line 130 of file lltreenode.h. Referenced by LLOctreeState< T >::remove(), and LLSpatialGroup::removeObject(). Definition at line 85 of file lltreenode.h. Definition at line 149 of file lltreenode.h. References LLTreeState< T >::getNode(), i, LLTreeNode< T >::mListeners, LLTreeNode< T >::mState, and LLTreeState< T >::setNode(). Referenced by LLTreeNode< T >::LLTreeNode(), and LLTreeState< T >::setNode(). Definition at line 99 of file lltreenode.h. Referenced by LLTreeNode< T >::addListener(), LLTreeNode< T >::destroyListeners(), LLTreeNode< T >::getListener(), LLTreeNode< T >::getListenerCount(), LLTreeNode< T >::insert(), LLTreeNode< T >::notifyRemoval(), LLTreeNode< T >::removeListener(), and LLTreeNode< T >::setState(). Definition at line 97 of file lltreenode.h. Referenced by LLOctreeNode< T >::getOctState(), LLTreeNode< T >::getState(), LLTreeNode< T >::insert(), LLTreeNode< T >::remove(), LLTreeNode< T >::setState(), and LLOctreeNode< T >::~LLOctreeNode().